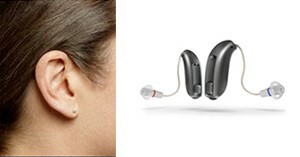 Mini Rite (Receiver in the Ear) hearing aids are used by people who suffer from mild to severe loss of hearing. This is the most common type of hearing aid available in the market today. It looks very attractive because it is small. With a tiny wire tube, it just sits behind the ear very discreetly. The tube is attached to the speaker sitting in the ear canal making the tube hidden. Mini RITE is the more discreet and compact version of the regular RITE hearing aids available. It is more useful, beneficial and better than the RITE hearing aids prevailing in the market. RITE hearing aids have been designed for the modern world. However, the one that has become more popular these days is Mini RITE. It is regarded as the most discreet device available today for people suffering from hearing loss. Position the device behind the ears. Once positioned, hold on to the wire of the speaker and insert the same into the canal of your ear. Gently push inside the earpiece until the wire is properly set and secured on your ear lobe as well as your head. It is very convenient and comfortable to use due to its miniature size. It is very handy and thus can be stored quite easily without the need for a bigger storage space. The device can be used by everybody suffering from mild to severe hearing disability. This hearing aid is very easy to clean as long as proper cleaning tools are used for the purpose. This hearing aid would only give reasons to smile unless you use something that is not suitable for your requirements. The only time the device may cause a problem is when you do not clean it properly. Inappropriate tools or wrong cleaning methods would affect the quality of the device to a great extent. Maintenance is the key for this device to perform well. If you are looking to purchase hearing aids in Calgary, it is best to check a variety of options from different vendors to make the right choice. Choose the one with the maximum number of sales and positive reviews. It is important to purchase a set that offers after sales service as well since you never know when you need to take the device to a service center. The best thing about this product is that it is available in different price ranges and varieties. Thus, you can choose as per your requirements and budget. If possible, run a trial on the device for complete satisfaction before buying it.